The last time I played at an Open Mic event with Accompanist 2, it was all Open and no Mic. In other words, I had to sing – and my accompanist had to play his guitar – with no mics or amps. Contrary to my usual dead feeling, I was actually nervous, as a result. I ordered a large red wine on arrival from the very friendly barman and I asked if the Open Mic was happening, as I could see no evidence of a stage being set for musicians. “Yes!” I fell on his potential sympathy and he topped up my wine without my asking and gave me a reassuring wink. 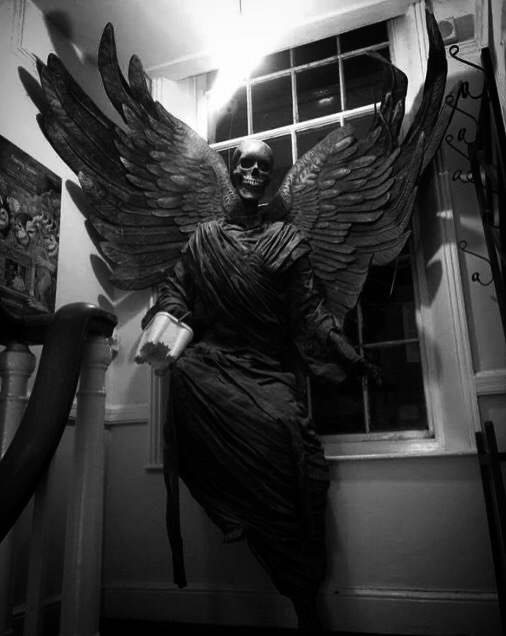 I smiled and thanked him and made a swift ascent up the stairs, almost falling back down when I encountered some sort of larger-than-life gothic angel-of-death statue halfway up. I heard a distant snort from Friendly Barman and continued on my way. I found a door at the top and opened it, spilling forth my apologies for tardiness to Accompanist 2. Everyone turned and looked and I realised that this was one of those very, very quiet Open Mic nights (Open nights? What does one call it when there is no mic?) and so I reduced my apology to a whisper and slid into a seat next to Accompanist 2 to await our turn. Our turn came and it was surprisingly successful. It turns out that I can sing without a mic and having used some seriously ropey mics at Open Mic nights, it was an unadulterated pleasure to have the worry of how terrible the mic might make my voice sound, removed from the overall concern. Afterwards, I realised that I was ridiculously hungry and so I hissed to Accompanist 2 that I was going to the Ladies – which I was – but I was also planning on swinging by the bar to grab a bag of crisps. Which I tried to do. “Have you played?” asked Friendly Barman, as he topped up my empty glass and continued, even when I tried to stop the flow of delicious claret nectar into my glass. OK, I didn’t try very hard. I told him I had and that it had gone well and wondered when he would reach down to give me my much-needed crisps. “There was an American football game showing earlier,” he continued, elbows resting on the bar, like he was never going to get me those crisps. And then he produced a platter – one of those huge oval ones that vol-au-vents are always on – with a mountainous pile of nachos, melted cheese and an assortment of dips. I stared at the platter before me and as I looked up to say ‘are you sure?’ and ‘thank you!’ before he could change his mind, he produced a plate of chicken wings. I explained I was vegetarian but thanked him anyway and made myself comfy for my unexpected and slightly surreal feast. I’ll just have a nibble I thought, so I could get back to Accompanist 2. But if you have ever tried to drag yourself away from a heaving platter of exclusive nachos, you will understand my difficulties. I scoffed the lot (this was pre-veganism, I hasten to add). Well, I left some, for fear of seeming gluttonous. “Where have you been?” hissed Accompanist 2. “I got some crisps,” I hissed back, very aware of how economical I was being with the truth. He leaned into me and I leaned back, thinking he was getting over-friendly. His hand moved towards me. He’s actually going to kiss me I thought, as I leaned back more, feeling my chest get hot and blotchy and aware of my eyes widening with horror. But his hand, instead of sliding to the back of my neck, as I thought, went to my mouth, as he carefully picked a small string of cheese from the corner. I would have felt humiliated, but I was relieved. His face was still very close to mine though; and his mouth stupidly close to my mouth. I’m not out of the woods yet I thought …perhaps he was just prepping my mouth for kissing. “Have you had … salsa? ?” boomed his voice. And everyone looked. “Funny story … “ I announced. On New Year’s Day I was ‘in the black’, on account of having received a paltry bit of redundancy. To celebrate, I treated myself to a Cineworld ‘Unlimited’ card, in which I persuaded myself to invest, so that I could write reviews for recent releases for a review website whose team I had recently joined. As with roughly 50% of my trips out, I tend to go to the cinema alone and so on this particular night, off I went to Cineworld and got myself a ticket for the latest Michael Caine/Morgan Freeman cinematic offering. The people at the front of the queue had not even settled on a movie to see, which baffled me. Who goes to the cinema without a movie in mind? It was a parent and a child and the former was becoming increasingly exasperated with the latter, who was struggling to reach a decision. But not as exasperated as I was becoming, as the official start time for the movie had passed, so I was steeped in borrowed advert time. I looked at the checkout girl who was as animated as an android. No – less so – if Michael Sheen of ‘Passengers’ is a benchmark for manifestation of android emotion. Finally, child was coerced into a decision and the chap in front of me stepped forward. I had no concerns about Chap, as he was alone and wearing glasses and a hoodie, so clearly he was a geek and therefore had planned his cinema trip as meticulously as I had. I purchased my ticket when my turn came and off I went, just a step or two behind Chap. The lady ripping tickets took his and mine simultaneously and ripped them equally simultaneously. “You’re not sitting together – you do realise that?” she looked at me, then Chap. I am not sure that I have ever witnessed anyone display such obvious embarrassment as Ticket-Ripping Lady. The apologies for her mistake were unending and as we moved away, Chap put out his hand to mine. His voice shrank to one of those male whispers that are actually louder than talking, as we proceeded through the doors to Screen 2 and stepped into the silent void of film viewing. And that was the extent of my relationship with Dan. I actually quite liked Dan, despite his clunky chat-up style, but those 15 seconds left me rather bewildered. Clearly, he saw the mistake as an opportunity but unfortunately, his nervous chatter precluded me from taking part in the chat-up process. But the film was good. There are benefits to having one’s hair cut by a friend. An Italian-accented reminder usually pings into my phone about an hour before my appointment and on this particular Saturday, I had overslept so the reminder was timely. I replied with an air of urgency and fell out of the door, into my car, having broken the cardinal sin of not bothering with coffee. In town I stopped at some small caffeine outlet in order to purchase a fix in a cup and continued on my way, aware of how questionable my purchase would seem at the salon, given that I was destined to be a couple of minutes late. My mistake was running with the precious brown cargo. I wove through crowds, barely noticing the finer details of individuals, apart from a very tall man who, for a brief moment, was ahead of me. And then it happened … my toe clipped an uneven paving slab and I did not just fall to the ground – I met the ground with such force that I actually slid along the pavement and overtook Tall Man. “Jesus!” he stopped and looked down at my prone form, complete with ripped jeans, ripped knee and a puddle of coffee nearby. Ok, It was likely I would see this man again because he was a friend. In-between laughing (I would have done the same) he helped me to my feet and commiserated over the spilt coffee. It’s good to be remembered, even if it is for being fairly clumsy and a little naive, to think that running with a hot cup of coffee is ever a good idea.